Desgined for large scale production and economy, a vest handled carrier is made of High Density Polythene, usually of very low gauge. This allows a very low cost bag to be used for holding a relatively heavy weight. 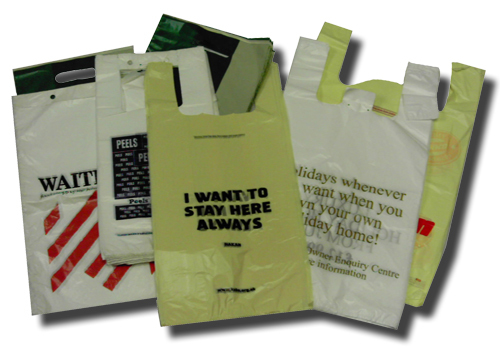 These carrier bags are available in biodegradeable materials although minimums apply. Subject to a surcharge, we can manufacture within a very short period of time a quantity of 10,000+. Please call for details. Lead time: 6 to 14 weeks. Available with biodegradable and degradable polythene additives for quantities of 500,000 or more. * If quantity is large enough any colour can be chosen for the material. ** Limitations apply to a print run of 50,000 bags. Beckdale.co.uk design and supply customised vest / t shirt carrier bags. Beckdale.co.uk fine staff have helped many clients buy bespoke vest / t shirt carrier bags. To order choose by material or similar , contact our offices via our contact page.